Jim Dowdall doesn’t beat around the bush….so we shouldn’t either. Below, you’ll find out quite a bit about him. Are you sitting comfortably? Jim has been in the entertainment business almost without a break for well over 40 years. Starting in the Circus working for a lion trainer and as an acrobat directly from leaving school at 16 and after a spell in a variety of other jobs like motorcycle mechanic and delivering cars, Jim entered the film business as an armourer on films like ‘The Dirty Dozen’ and ‘Where Eagles Dare’. He later wrote a book on the subject ‘Brassey’s Military Small Arms of the World’ which was published in 1973 and as a member of the Historical Breechloading Small Arms Association, occasionally lectures on WW2 automatic weapons at The Imperial War Museum. A spell in The Parachute Regiment (champion recruit) in the early 70’s was ended by a bad jump causing vertebrae damage. After recovery and working as a walk on and also as an assistant director, Jim entered the stunt business. As an all round stunt performer Jim was involved in every aspect of stunt work including medieval jousting in the USA. 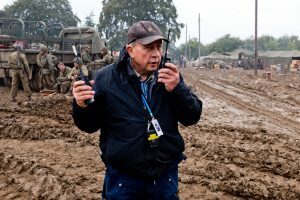 Jim has worked on almost every kind of action film including 9 ‘Bonds’ ‘Superman’ ‘Star Wars’ ‘Indiana Jones’ ‘Batman’ to ‘Enemy at the Gates’ ‘Saving Private Ryan’ etc. Please see here for full list of credits. As a collector of WW2 military vehicles and motorcycles, Jim has a very practical mechanical knowledge of cars, trucks, tanks and motorcycles. He owned a WW2 amphibious DUKW for 25 years and crossed the English Channel in it for the 50th anniversary of D Day. This interest and familiarity with things mechanical (particularly military…) has stood him in good stead and he has consulted as military adviser on a number of films including ‘Enemy at the Gates’ and ‘The Pianist’ where he was also the stunt coordinator. He also has a huge amount of experience with both helicopters and fixed wing aircraft and has a list of excellent pilots he’s used to working with worldwide. In 1992 Jim drove a Land Rover through the jungles in Brazil and Guyana for four weeks for the event known as Camel Trophy. Jim still drives the high speed Pursuit Arm American stabilized camera system for car commercials and car chases and also drove the high speed Mitsubishi Evo tracking car for all the race sequences on ‘Rush’. With over 300 car commercials on his resume, Jim has driven cars for EVERY European and Japanese car manufacturer with the exception of Rolls Royce and Morgan! He was awarded an honorary fellowship of the BKSTS at the same time as David Attenborough. Jim is a member of BAFTA and is occasionally asked to speak at film seminars run by the Academy. Jim coordinated his first film in 1978 and has been performing in and coordinating films, TV shows and over 450 commercials ever since with an excellent safety record. He also has an X3 media safety certificate. He has also been the stunt coordinator on many episodes of ‘Top Gear’ and is at present coordinating on ‘The Grand Tour’. Jim believes that the best action for a stunt sequence is obtained using 3 things. A mutual understanding of the director’s requirement and vision for the sequence/commercial. If budgetary constraints diminish the original concept, the coordinator should be able to suggest an alternative/cheaper method of portraying (and occasionally enhancing) the same storyline. Employing the best performers for the job combined with the safety requirements to protect all those performers (given that it is a stunt and by definition,,,dangerous!) and the rest of the crew to ensure that everyone goes home safely on ‘wrap’.